Not sure exactly who (or what) Brie Cadman is, but he/she/it is hired. On the spot. I get texts and emails and Tweets regularly alerting me to White Truck This or White Truck That. Received a link to Brie's web site last week and an item about vehicles' "tells" totally echoes what I've been chirping about for years. Pickup drivers don't like high-density living situations and are more likely to be dissatisfied with their lives. They tend to be workaholics, have lower education, be full-time employees, have service-related jobs, and be middle-income. I rest my case. Until next week. *Man sees a couple arguing and decides to run over the husband in a ... White Truck. 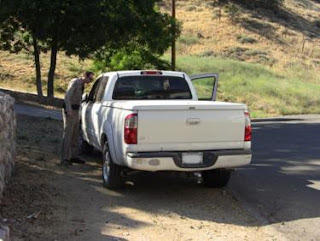 *64-year-old cyclist hit and killed by a ... White Truck. *Drunk driver runs a red light and kills his passenger in a ... White Truck. *4-year-old boy killed by rollaway ... White Truck. *Driver attempts to break into ATM and then flees police in a ... White Truck. Odd since white trucks are most commonly service trucks and company fleet vehicles so they don't even choose the color. Sssshhhhhh. You don't want RW to have to make this a rational weekly time waste, to you? If any of this white truck stuff made any sense (i.e., was in any way valid), he'd have to write an actual column 4 instead of 3 days per week (Whitt's End, that is, RW's written version of The Two Minute Drill, doesn't count, either). Do people actually read this drivel every week??? What color is prevalent among attention-starved middle-aged whiny egotistical yuppies with the small-man complex? That wasn't mentioned in the "study." In other words, what color is your vehicle, Richie?